Here in Clifton, New Jersey one sees steps – and then one sees steps. They can be long flights and three-step hops. Steps can be plain-Jane and utilitarian, or they can be ornately designed and made of marble. We can do them all – we have done them all. And if you want a ramp or a slope for disabled access to an entryway, AAP Construction will be pleased to construct that for you. If you require utilitarian concrete steps at your Clifton location, we're there to make them for you – except that we'll go the extra mile to ensure that every step is perfectly level and all steps are of equal height. As for the number of steps and their span, we'll outline a few choices for you so that the end-product is a perfect fit for your needs. 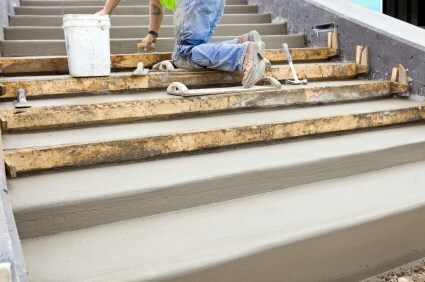 AAP Construction's aim would be for you to have the best looking yet most rigorously constructed steps in Clifton, NJ. As the entry way to your Clifton house or building, your steps are among the first impressions that your visitors will have. Impress them with a stately or elegant set of Clifton steps. Phone us at (973) 298-1013 today and an expert will arrange to meet you to discuss designs and styles. No matter what you select, rest assured that the high quality of our materials will match that of our work. Hard to believe, but AAP Construction will have you taking pride in your new set of Clifton steps! 5★★★★★ - "AAP poured the pad for a large shed and gazebo. Both were perfect and competitively priced." 5★★★★★ - "He is a great great guy, very responsible company which is hard to find. I had him do a small project for me in the past, before we started this larger project. I have a lot of confidence in his work and what I like is that he delivers what he promises." 5★★★★★ - "His quality is excellent and this is the best installation I have ever had. Adrian was very accommodating, dependable and runs a great crew. All the stone work was done beautifully and I am extremely happy." 5★★★★★ - "The best contractors overall at any level." 5★★★★★ - "I am very very satisfied with all the work, he is an excellent builder, honest and sticks to his bids."